Zion National Park is located in Southern Utah which is considered “desert landscape” meaning that the temperatures tend to be a bit warmer than the more northern parts of the state. However, there are still chances of rainfall in the winter causing icy trails and roads, and sometimes when temperatures get low enough, snowfall happens. With that said, here are a few tips to keep you safe while you are adventuring in Zion this winter. Stay on open trails only! During the colder weather, some trails and roads may be closed due to the weather. Do not attempt to hike these trails or travel these roads, they are closed for a reason. Wear appropriate clothing. 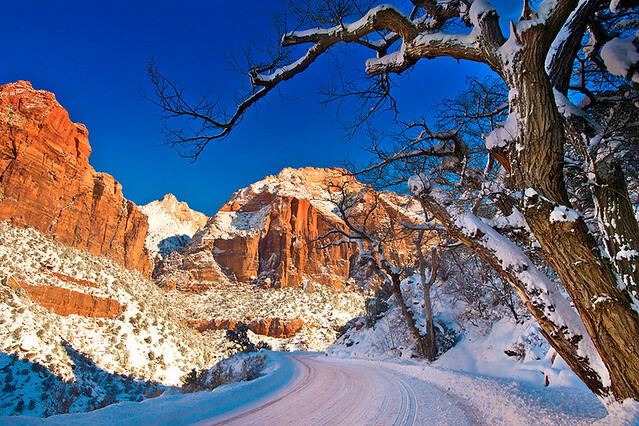 Thermals and snowsuits aren’t always necessary in Zion as it is a bit warmer climate, but heavier jackets, pants, boots, gloves and beanies are recommended to stay warm. If there has been recent snow or rainfall, be sure to use gear that aids in traction as well as shoes with good traction. If camping, be sure you’ve packed the appropriate gear to stay warm, especially at night. Temperatures in the desert drop dramatically at night year round, this is especially true during the winter seasons. There is potential for hypothermia, frostbite or even freezing in your sleep, so make sure you are wearing the right clothing and have good thermal-type sleeping gear to avoid those dangers. Keep an eye on the weather, or check with the visitors center to see what the weather is going to look like during your trip. THIS IS VERY IMPORTANT. Days can go from warm to snowfall or rainfall very quickly, make sure you have a heads up of what to expect so you do not get trapped on a trail or in the backcountry. Make sure to have a first-aid kit on hand at all times. NEVER HIKE ALONE. This is very important, in cases where someone is injured it is important to have someone else there to help with wounds, keeping warm and or retrieving help. Stay out of the river, (we know this seems like common sense, but you’d be surprised). Swimming during the winter can result in hypothermia, frostbite and potentially death. No matter the time of year it is, it is always important to make sure that you follow rules and regulations as well as prepare your own safety plans. Make sure you can enjoy your trip to the fullest without mishaps.